The Ergo Flight Ultra Light Weight Wheelchair is available in two seat widths - 16" and 18" and two axle types - "fixed" (large back wheels cannot be removed for storage/transport) and "quick release" (large back wheels can be removed easily for storage/transport.) This wheelchair is crafted from Aircraft grade aluminum, which supports up to 220 lbs. With a wheelchair frame weight of only 14.5 pounds, this chair has a strength to weight ratio of over 13 times its own weight. The built-in seat cushion is anti-bacterial and easy to clean and the footrests are detachable. These wheelchairs all have fixed armrests with concave arm pads, 20" rear polyurethane tires, 6" x 1" front casters and built-in carrying pouches. 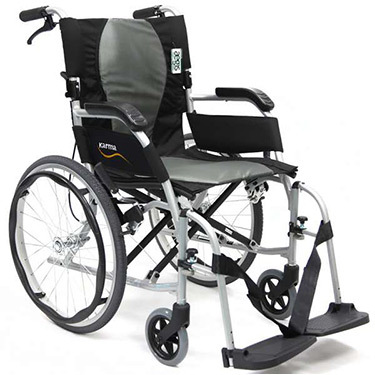 Each wheelchair folds down for transportation and/or storage and comes in a pearl silver color. The total weight without riggings is 19.8 lbs. S-2512F16SS 16" 17" 8" 18.5" 17.5" 36" 25" 220 lbs. S-2512F18SS 18" 17" 8" 18.5" 17.5" 36" 27" 220 lbs. S-2512Q16SS 16" 17" 8" 18.5" 17.5" 36" 25" 220 lbs. S-2512Q18SS 18" 17" 8" 18.5" 17.5" 36" 27" 220 lbs. Neads improvement, Karman does not have a good customer service. They just want to sell, not go the extra mile, Their to big to care for the individual. The finest wheelchair I have ever seen! I have a wheelchair I received in 1993. It is heavy and I can no longer get parts for it. It is now relegated to sit on while I work on my recumbent trike. I have been using it to care for my wife which is my full time, blessed job. This one is 10 lbs. lighter and folds MUCH smaller. At 82, it is hard to lift in and out of the car trunk. This one is more than twice as easy. It is very comfortable for my wife and it's operation is much easier. It is not necessary to remove the chair legs to put it in the trunk and there is a lot more room remaining for other things.